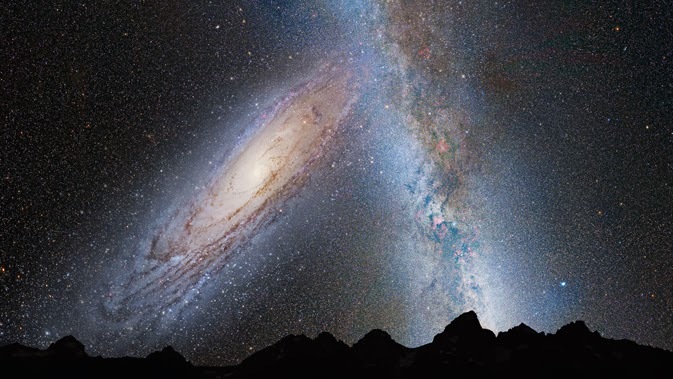 NASA's research has found that the our Galaxy the Milky Way is going to crash into the Andromeda Galaxy 3.75 Billion + years in the future. Yeah, it's a long way off, but its still kind of creepy to watch their video of what will happen over time when this occurs. You can read their full article here. Though for some reason the video doesn't work on their site, but you can see that below. This would lead to quite a bit of chaos, imagine a sci-fi future where stars jostle about, they move, and are destroyed, and everyone must move to spaceships to avoid being destroyed along with them. Would we leave planets which couldn't get into ships to their fate or would we save them? Or are we dumb enough to give up technology and so we're the ones who need rescuing? Or of course you could also imagine the tale of a galaxy similar to ours that is far far away and going through this same thing.